PHUKET: A project to educate 2,000 students from 20 schools across Phuket about disaster preparedness, involving international experts, drew to a close at Saphan Hin yesterday (June 21). 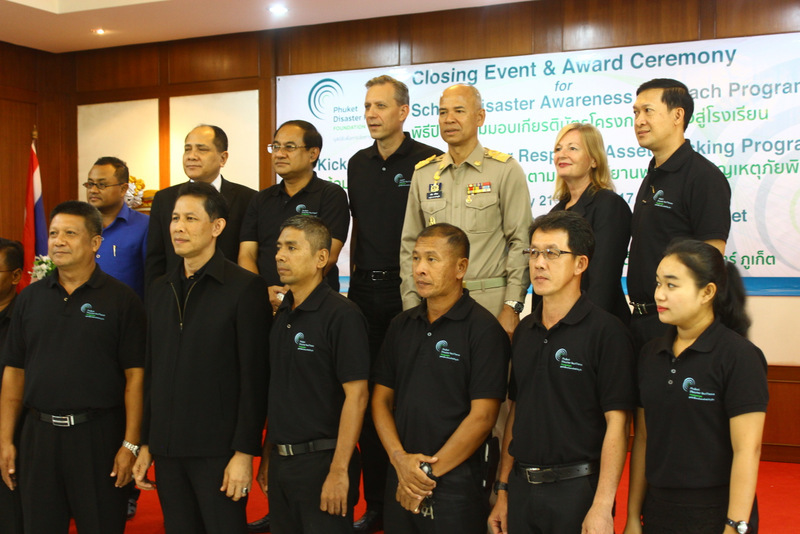 The project marked the launch of a new initiative to bring together resources from all aspects of society, including hotels, resorts and other businesses, to help respond to disasters should another one befall Phuket. Andreas Schaffer, Sustainability Director and Head of Applied Projects Group at EOS, explained that the School Outreach Project is an integral part of a broader ambition of the Phuket Disaster Resilience Foundation. The project, “Building Community-Level Disaster Awareness – School Outreach Project” held at the Srinagarindra The Princess Mother School in Phuket, involved experts from the Earth Observatory of Singapore (EOS) and was organised by the Phuket Disaster Resilience Foundation. Students from across Phuket taking part learned about how earthquakes and tsunamis are created and how to respond if one occurs. Students were involved in earthquake and tsunami safety sessions from June 5-16 with the first project focusing on topics that engage 11- and 12-year-olds attending school in Phuket. A second round of training, expanding to 30 schools, will be starting this October. The training series is aimed at teaching children about earthquakes and tsunamis, in order to help them to think critically, make the right decisions and take action during disaster events. To reinforce their theoretical knowledge of disaster safety, the children participated in several activities, including a mapping exercise of the different evacuation routes in their schools. 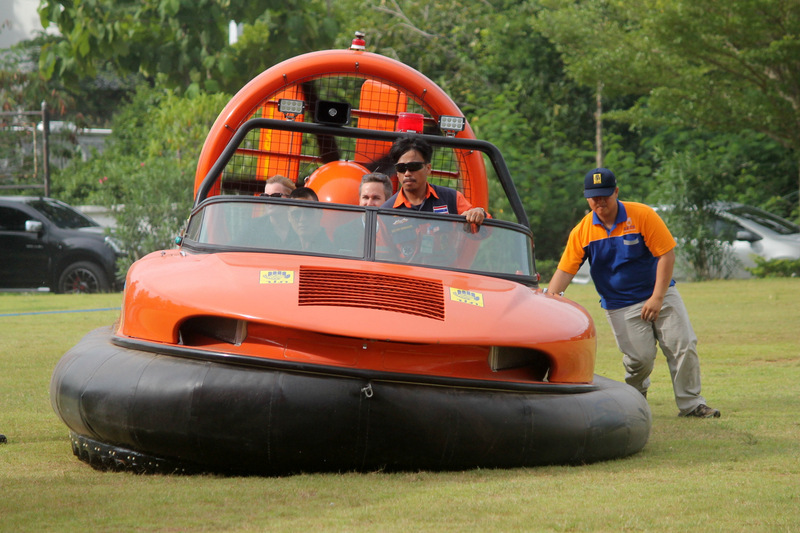 The Earth Observatory of Singapore sponsored this first round of training that featured professional trainers from the the Department of Disaster Prevention and Mitigation Phuket office (DDPM-Phuket), as well as Phuket-based members of the DDPM Academy. The training series was designed to introduce 11- and 12-year-olds to Disaster Resilience – a topic that the School Outreach Project plans to integrate into the on-going curriculum of the schools in Phuket. Presiding over the event yesterday was the Deputy Director General of the national Department of Disaster Prevention and Mitigation (DDPM), Kobchai Boonyaorana. 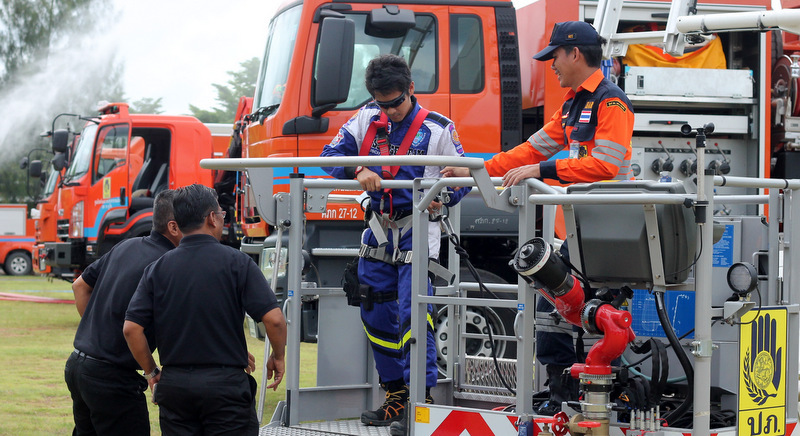 As part of the event, DDPM-Phuket officers showcased the equipment and skills on hand to respond to impending disasters. 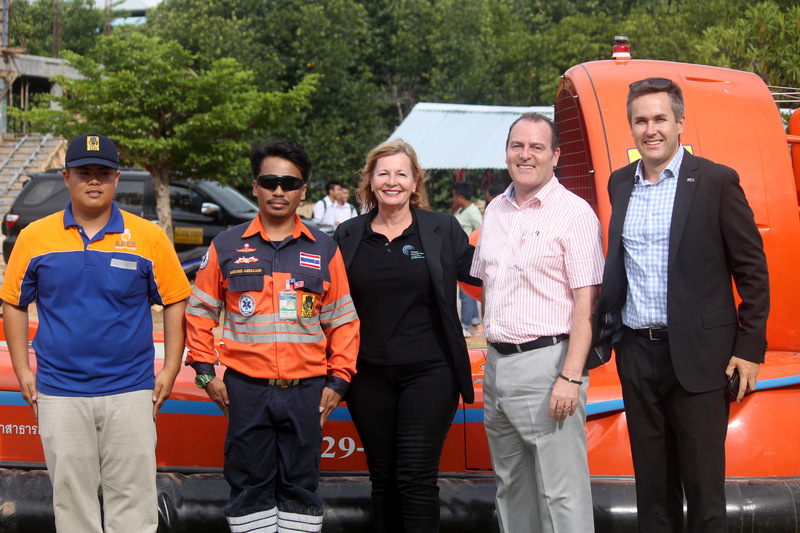 Also present were Phuket Disaster Resilience Foundation Board Members Jayne MacDougall and Andreas Schaffer. School Outreach Project Leader Jayne MacDougall, from Le Meridien Phuket Beach Resort, explained, “The Foundation is in a unique position to focus on disaster resilience with the support of specialist representatives from key positions within government, academia, business and the community. “Education of the youth of Phuket seemed the natural starting point for this effort,” she added. Ms MacDougall is well known across Phuket for being the first to bring professional lifeguards from Australia to train local lifeguards in essential surf lifesaving skills – long before any moves by local authorities to support training of local lifeguards to help prevent drownings at Phuket’s beaches. 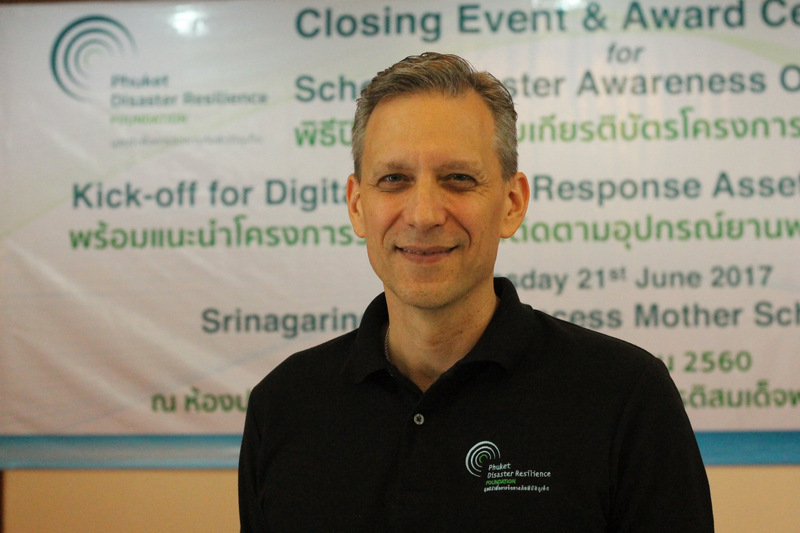 “EOS recognised that we need to strengthen collaborations between relevant stakeholders in Phuket to enhance disaster preparedness,” said Mr Schafer. “So EOS scientists conducted a scientific assessment of what disasters might possibly happen, and we then developed a framework for bringing the right stakeholders from Thailand and Singapore together. “The School Outreach Project is one of several projects we have identified that will help Phuket improve its overall disaster resilience capacity. “We are proud to be collaborating with DDPM-Phuket, DMRC 18, Prince of Songkla University Phuket Campus, and others, to advance the foundation’s cause,” he added. 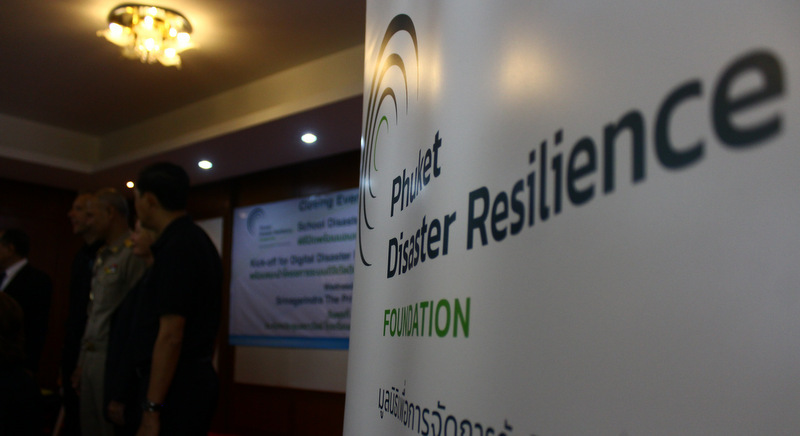 Beyond the student training, the event yesterday also marked the public unveiling of the Phuket Disaster Resilience Foundation’s “Digital Disaster Response Asset Tracking Program”. The initiative aims to distinguish itself as institutional platform, and to “act as a communication channel for various important members on the island to come together and talk, share and communicate ideas and projects,” explained Ms MacDougall. “The foundation has an idea and will invite the stakeholders to discuss. Knowing what we have can effectively aid decisions,” she said. Promoting collaboration among various hotels, hospitals and government agencies can be key in critical situations, Ms MacDougall explained. “They each may have something the other requires, but does not have. So why not join forces?” she said. “Resources sit distributed through all sorts of organisations. Hotels have backup power generators, backup water supplies, that’s the kind of stuff that I, as a governor, would want to know if a big disaster strikes,” Ms MacDougall pointed out. “There are 100 large hotels that can provide power to this part of the island. I need to know what they have, I need to know where it is, I need to know their operation. Until today, we don’t,” she said. “Let’s make all the information ready today, so if a disaster strikes you have it,” she added.